The Great Singapore Sale is a fixture in the calendars not just of locals but foreigners who love a bargain. I have numerous friends who are flying in for some retail therapy. 1. Get the GSS Tourist Privilege Card to enjoy exclusive discounts – simply present the Tourist Privilege Card with your foreign passport to start enjoying special privileges. 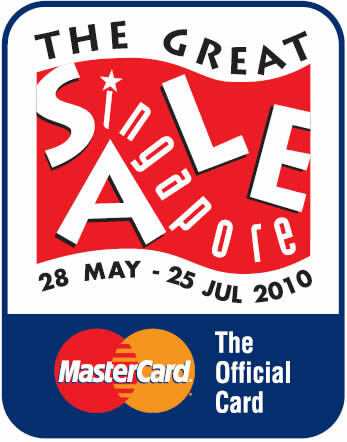 Download the card from the GSS Official Website at www.greatsingaporesale.com.sg. You can also pick up the card from the Singapore Visitors Centres. 2. Spend above S$300 in retail purchases in same-day combined receipts (maximum of 3) during the Great Singapore Sale and redeem a GSS limited edition bag at the Singapore Visitors Centre @ Orchard. Grab yours today, while stocks last. 3. Tourists can redeem free taxi vouchers worth S$30 or S$15 when they spend S$300 or more using a MasterCard® card or cash respectively from 28 May to 25 July 2010, while stocks last. 4. Shop with your MasterCard card at participating outlets and you could receive shopping vouchers, dining privileges and exciting prizes. Visit mastercard.com/sea for more information. 5. Shop till you drop with extended shopping hours till 11pm on Fridays and Saturdays at participating malls. 6. If you’ve forgotten to get gifts for friends and relatives, do your last minute shopping at retail outlets at the Singapore Changi Airport. With a wide variety of shops from luxury brands, electronics and Singapore-inspired or local products, there’s sure to be something for everyone. 7. It’s not just all about shopping – also take the time to enjoy other events happening such as Singapore Arts Festival, Singapore Food Festival, Singapore River Festival and Singapore Garden Festival and many other entertainment options during this period. 9. Be the first to visit the two Integrated Resorts, Marina Bay Sands® and Resorts World™ Sentosa that have just opened their doors with exciting and exclusive choices of lifestyle options. Expect exciting shopping experiences at Singapore’s two new Integrated Resorts. If you are going to the casino, BRING YOUR PASSPORT. 10. Do your research. http://sg.shoppingnsales.com/ and http://livinginsingaporetoday.com/ have regular sale alerts.